There were a few signs of life from the Phillies in last night’s 4-2 win over the Red Sox. First, the fact that they won after a 0-8 beat down in the home opener is encouraging. Second, pitcher Aaron Harrang dominated the Red Sox line-up. No one was really sure what to expect from Harrang after a spring that seemed to be riddled with back issues. But through 6 1/3 scoreless innings, Harrang proved he is ready to go. Jeff Francoeur also had something to prove after spending nearly all of last year languishing the Padres minor leagues. 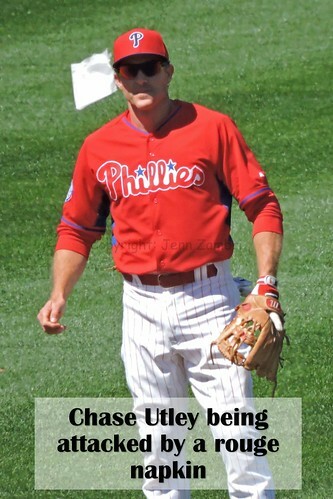 He gave the Phillies their first runs of the season with a 3-run homer in the 6th inning. If Francoeur can continue to find some of his old, Braves-days magic, he could see some descent playing time. Another good sign was the speedy Ben Revere, who turned a Sox error into 3 bases in the 7th inning. His hustle led to a run after Chase Utley hit a sac fly. 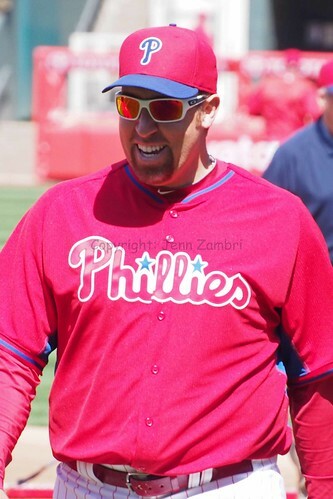 And Carlos Ruiz had 2 hits on the day batting 2nd, which is also nice to see. The one not-so-great sign was Ken Giles. He was all over the place pitching in the 8th inning. Giles gave up a hit and 3 walks, which accounted for both Red Sox runs. After he walked a run home, manager Ryne Sandberg finally went out to get him and let Jonathan Papelbon earn a 4-out save against his old team. Giles had some soreness in spring training. His speed is down and his control is missing. One has to wonder how healthy he is. Tonight, David Buchanan gets his first start after a very encouraging spring. Game time is 7:05pm. Well it wasn’t pretty, but the Phillies did beat the Pirates in two exhibition games this weekend. Friday’s game was damp and icky and today was WINDY and cold. When I say windy, I mean the kind of wind that sends 5 giant trash cans at once hurdling across Ashburn Alley without warning. At one point, I actually had to stop and hold on to something. It was that bad. And the players on the field had fun avoiding all of the floating debris. The Phillies also had to avoid many, many bad pitches from the Bucos starter, Charlie Morton. This guy was all over the place. In the first inning, he was so bad that the game was stopped; I am not sure if it was to warn the managers or if the Pirates thought he was hurt, but both managers were spoken to. The Phillies wound up scoring 4 runs in the inning after Morton hit 2 batters, walked 3 and threw 1 wild pitch (at least, officially it was 1). Needless to say, there was a lot of dancing at the plate. After scoring 2 more runs in the 2nd, the Phillies sort of went to sleep. I, however, could not sleep, as I was freezing and being pelted in the face by 50mph wind gusts. Although this did not seem to faze pitcher David Buchanan. He pitched a scoreless 5 innings, allowing 2 hits and 2 walks. The effort paid off as the Phillies announced that Buchanan will be the #3 starter behind Cole Hamels and Aaron Harrang. So the Phillies went on to win by a score of 6-4, ending their Spring Training with 14 wins. Overall, it was a pretty bad spring with sloppy play and a serious lack of offense. But none of it counts, so on Monday, we will see what this team has in store for us this season. There are a lot of new faces and people playing new positions, so at the very least, it should not be too boring….I hope. Hamels will pitch on Monday for Opening Day. Game time is 3:05pm. And here is the Photo Album from today’s game. See you on Monday!